John Mueller is anything but a newcomer to the Texas barbecue scene. John’s father, Bobby Mueller, operated Louie Mueller BBQ up until his death a few years back. 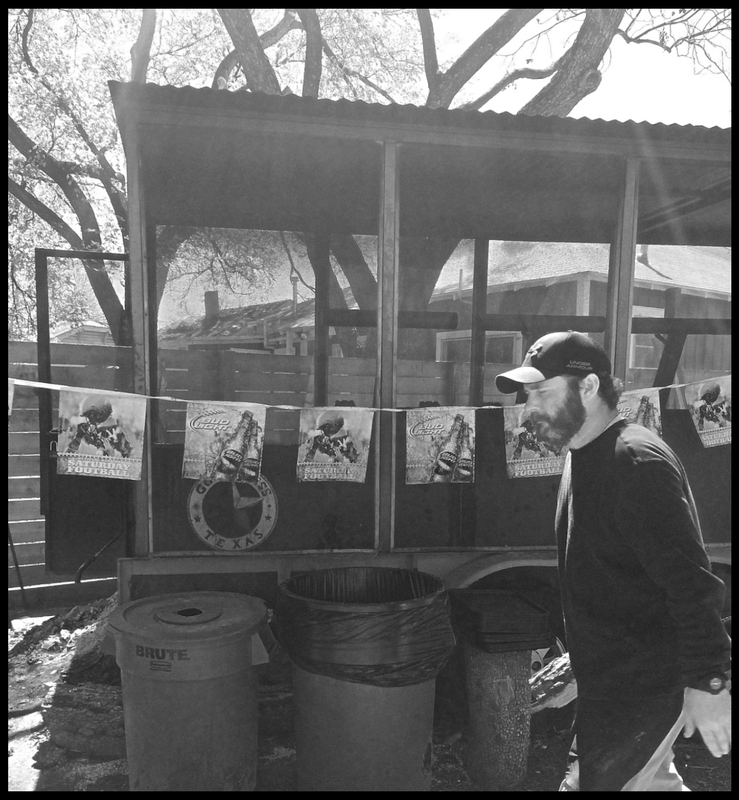 John learned his trade at his father’s capable hands, and brought his craft to Austin, Texas. 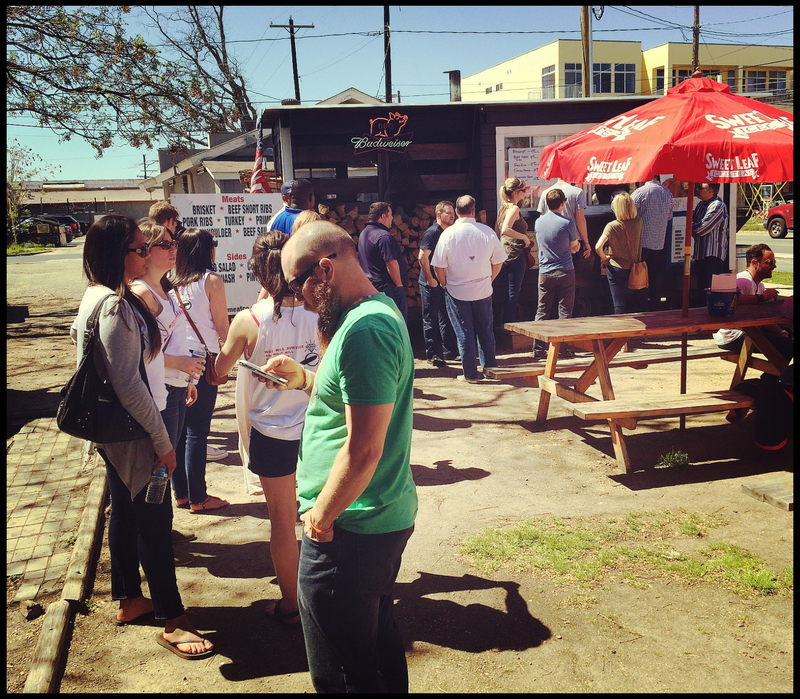 John’s first venture was taken over by his sister, LeAnn Mueller, and renamed La Barbecue. 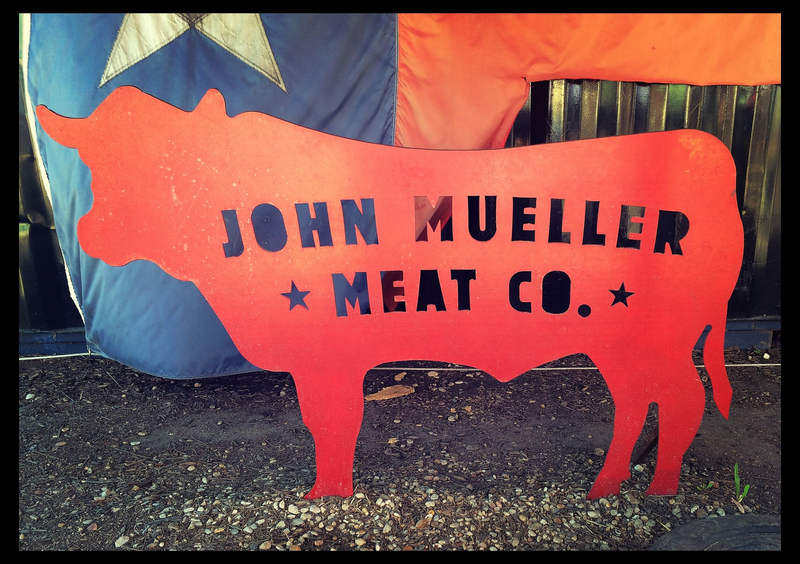 John then opened up John Mueller Meat Co. down the road a bit at Perdenales and 6th Street on the East side of I-35. John is known for his abrasive customer service, and rigid adherence to his craft. 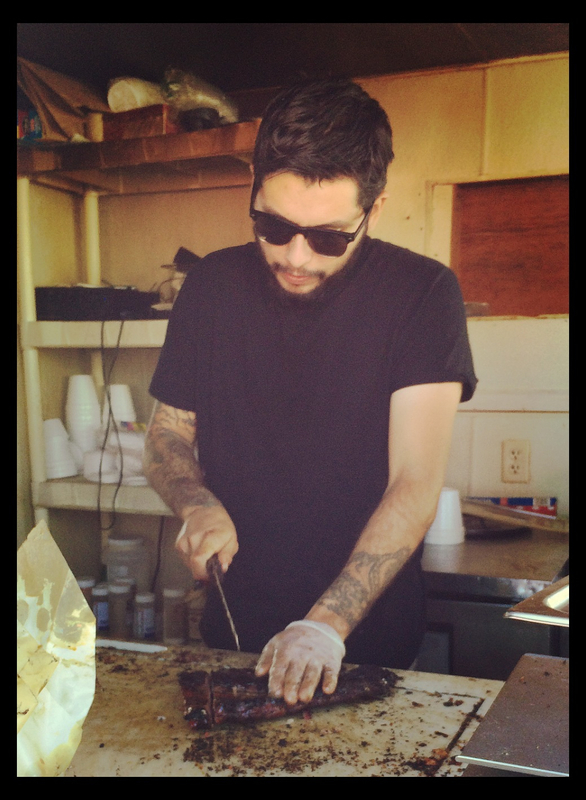 John doesn’t only own the food trailer, but also serves as the pit master, and is seen stoking the pit fire and bussing tables throughout the lunch rush. The location consists of two trailers, one containing the large pit and the other for food service. The usual long line goes quickly, taking only thirty minutes or so during the noon hour on a Friday. John Mueller Meat Co., located at 6th St. & Pedernales St.
John attempts to keep the meat in stock throughout the day, opening from 10:30 a.m. – 6 p.m. Thursday through Tuesday. Inevitably, meat sells out, and is taken off the menu as the day wears on. So if you want to try something specific, you had better arrive early. John has done an admirable job of creating a fun atmosphere, bringing what he calls the biggest backyard BBQ to Austin. The picnic tables and BYOB policy encourage mingling of the patrons. The photo was taken under the red canopy of the picnic table, throwing off the color of the meat. Be sure, the smoke ring is thick! 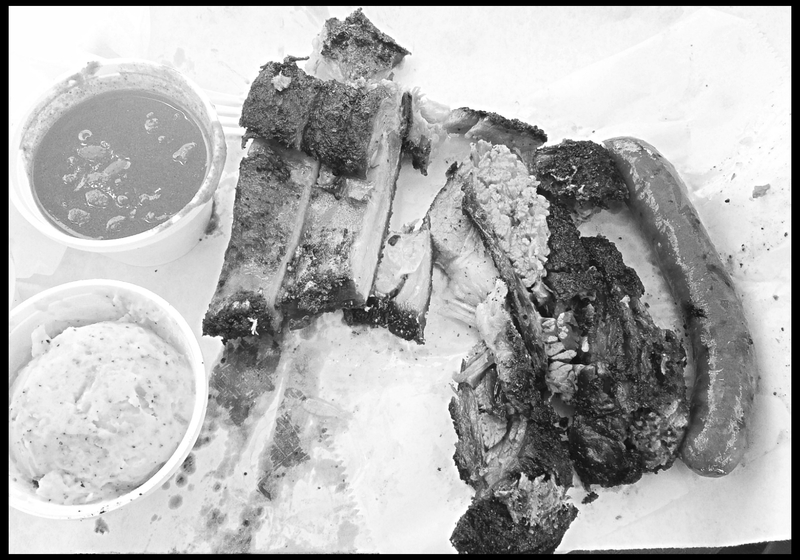 As highly praised as John Mueller Meat Co. has been in the Austin media, the staff at The Best of Texas Barbecue had elevated expectations of John’s meats. 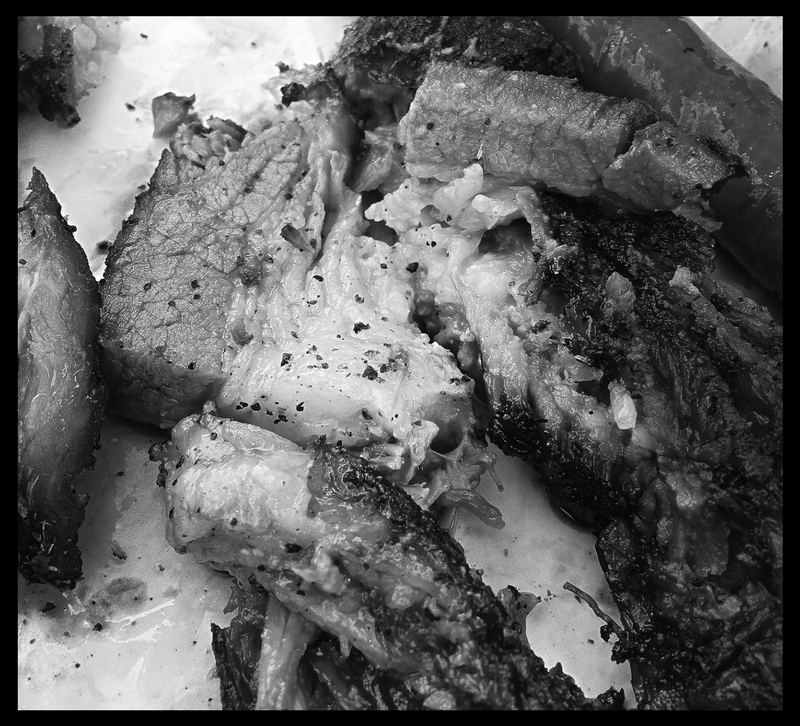 As the author’s tray was piled high with brisket, expectations seemed to be met at the sight of a perfect smoke ring, and thick, textured bark on the burnt ends of the brisket. Unfortunately, the flavor was not able to keep up with the appearance. Between the charred bark and the thick, unrendered fat, the author was unable to finish his portion, and threw away nearly 1/3 pound of inedible pieces. Be warned, if you request burnt ends, you may just receive burned brisket. This was extremely disappointing to the staff. The fat was not properly rendered, leaving a fatty, charred brisket. On the ends of every pork spare rib is a little clump of meat and tendon. This piece is cut off of some ribs, as it is not as easy to eat. Oftentimes, this delectable piece of meat is the best part of the experience. The same can be said of a similar flap of meat on the backside of the bone. Of the ribs sampled, these treats were inexcusably overcooked, leaving them chewy and tough. However, the flavor was fantastic, coming through with each morsel. The beautiful bark on the ribs were packed with flavor, making for a very enjoyable treat, if only the ends were cut off. John offers handmade beef sausage by the link. The link sampled was perfectly cooked, with an intact casing. The loose-packed meat was not too dry, and not too wet. Surprisingly, the sausage lacked any flavor. The author was dumbfounded, having never tasted such dull sausage in all his life. Sausage is typically one meat that is easy to make delicious, as the ingredients are blended together to this specific end. Sausage doesn’t rely on an external rub, or sauce to add flavor, as the spices are commonly mixed right in to the ground meat before packing. 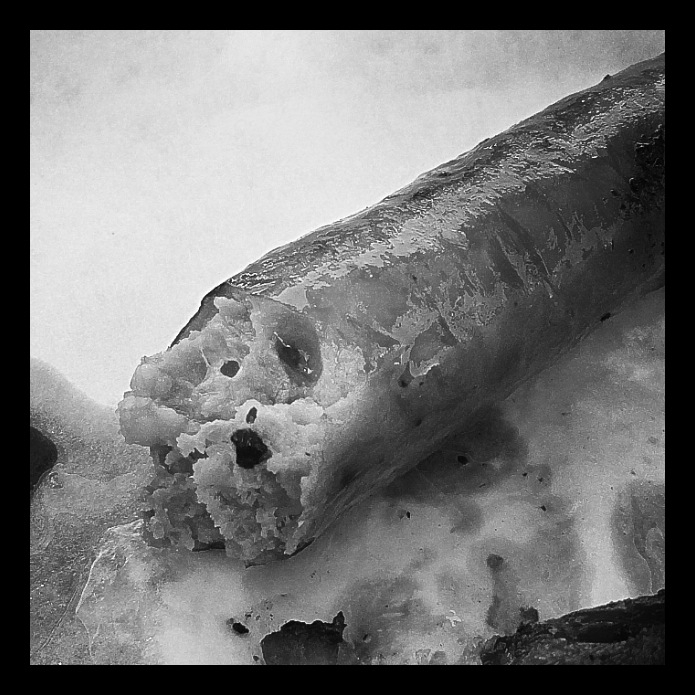 Inexplicably, the sausage at John Mueller Meat Co. was bland, and not worth eating. The author, dismayed, threw the majority of the link in the trash. The loose-packed sausage lacked any real flavor. The potato salad was decent, delivering a bit of a kick to an otherwise pedestrian variety. The beans, on the other hand, were anything but common. The pinto beans tasted more like chili, sans meat. They were hot and spicy, with a thickening agent. The sauce was perhaps the best thing John Mueller Meat Co. had to offer. It was nearly identical to the sauce offered at Stiles Switch BBQ & Brew, which is not surprising, as both John and Lance at Stiles Switch learned to make barbecue (and most likely the sauce) under the tutelage of Bobby Mueller. It is a ketchup-based sauce that is akin to a tomato basil soup. John Mueller, adding another log to the fire. All in all, the meats fell flat. Another visit might be in order to confirm or refute the experience, but at the going rate for BBQ these days, it won’t be any time soon. This entry was tagged Bobby Mueller, John Mueller, John Mueller Meat Co., LeAnn Mueller, Louie Mueller BBQ, Stiles Switch BBQ & Brew, Texas barbecue, The Best of Texas Barbecue. Bookmark the permalink.